Music has an amazing way of creating pictures in your mind. It can pull memories out of the furthest reaches of your soul, no matter how far back they were buried. They can bring feelings you forgot you felt or never felt before at all. It can conjure up images and moving pictures inside your brain that seem to be narrated by those sounds as if perfectly choreographed and scored by masters in the field. Sometimes it's the least likely sounds. Sometimes it's music you had no idea you would ever fall in love with. Sometimes its those pictures in your mind that light the flame. When I was growing up, my father had a Victrola. (he still does, actually) He happened to have a lot of bluegrass music on 78's and used to play them as loud as it would seem that lovely old wooden machine would go. This is my first recollection of hearing what I know to be this wonderful audible slice of Americana. I had largely forgotten about it until now. As I find myself more and more immersed in the jam scene, my eyes and ears are progressively a little more opened all the time. I scroll through websites, articles, Facebook groups, twitter suggestions. I am constantly on the lookout for the next thing to surge into my soul via my ears and light the candles that reside there. I am continuously amazed at how much there is to explore. I am constantly amazed at how much I just have not heard. The best part is sharing this with other people. I love to share music, especially with the people least likely to like it. My husband is a big push in these areas, as this is his scene. He has been an active musician for most of his life and it's this scene where he found a home. It only took him four years to yank the blinders off of me and get me to really look. I had to realize that everything I thought was true about this scene - mostly a caricature of Phish fans by people who didn't like Phish - was incredibly wrong. I was missing out on a great ocean of music dotted with the islands of different sounds. I was limiting myself. While some people are content to live their life in the safety of their music comfort bubble, never straying too far from their sound and their scene, never wanting to admit that that polar opposite sound lit a candle inside of them even just for a second...I'm just not. I wanted more. This is where I found it. I have been seeing The Kitchen Dwellers everywhere. They are mentioned quite often in these circles, and that usually leads to my curiosity. 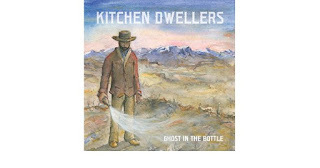 I happened upon their album Ghost in the Bottle on Spotify not long ago after drowning myself in Railroad Earth one day. I gave the album a once through and really enjoyed it. Put a pin in this, I told myself. Fast forward to last night and my husband Eric was at The Stanhope House for their show with Wig Party and Panda Jam. I was home with my kids, enjoying a quiet evening and fielding texts about the show. Just then, I had an "Oh Yeah!" moment. I woke up this morning to a copy of the CD next to my bed. It's been on repeat pretty much since. I'm overwhelmed with vibes and feelings the more I listen. There is a strong sense of timeless folk in the songs. There is a sense of culture. There is something in this music that is older than all of us and has traveled across the world, sharing these vibes to generation after generation as it melded with other vibes and planted these seeds presently in The Kitchen Dwellers. There is so much to this sound that it's easy to become lost in it all, and not mind one bit. Its guitar (Max Davies), banjo (Torrin Daniles), mandolin (Shawn Swain), and bass (Joe Funk, who by the way has the coolest name ever). There is also some key work on the record, courtesy of Little Feat's Bill Payne, some electric guitar in one song by Mihali Savoulidi of Twiddle, Tim Carbone of Railroad Earth on fiddle, and Anders Beck of Bluesky Bluegrass on something called a dobro. More on that in a minute. Do you know what that means? There is no drummer. The great thing about something so bare and raw is how full that sound is, but there is nothing to hide behind. There are no pedals to distort what you are doing. There are no effects. There is no computer enhancement. It's music in it's purest form and highlights talent and mastery of an instrument. You sink or swim, and these gentlemen are not just swimming, they are floating. I'm new to this, but I am already a little bit obsessed. A song like Buckle Down, for example. The way those seemingly simple strings melt together while still staying so individually beautiful is nothing short of hypnotic. This song features the flavors of Bill Payne as well and what I like so much about it is how much is compliments the sound. It takes nothing away, it covers nothing up. It floats in between and weaves those flavors through. The vocals through the whole record are amazing. Everyone in this band sings and they compliment one another perfectly. Colder Nights is another song I really love. There is a feeling of hopefulness taped with complications in the vibe of this song. It has that chugging pace that lends itself to someone chugging along through life, trying their damnedest to get through, despite themselves. This song features Anders Beck from Greensky Bluegrass on dobro. I won't lie, I had to look up what a dobro was. In case you, like me, are just not in the know on things like this, it's a wooden bodied guitar with a single resonator. So there you go. This has been your "Music Instruments With Amanda" lesson for the day. There will be a test. This whole record has the feel of the mountains. I don't want to sound cliche by saying that as that is obviously the origins of bluegrass music, but it's the truth. Its there and its prevalent and it's beautiful but that is so not all there is here. It's this incredible visual blend of lush green Irish countrysides and Appalachian step dancers and modern festival jam groove all happening at one time inside your mind. It's feelings. It's explosions of colors and vibes that can at times completely overtake you as you listen. I want to get in my car, turn this up loud, and head West. I live in New Jersey, but we have some lovely mountains full of lush greenery. It makes me want to go there and blare this album just to dance. Listen to The Crown and feel it every time the song comes around that you just want to bring every ounce of anger you ever had and explode it into something with the positivism of music. It feels like hope in the summer. Visions of Mohr: Easily my favorite song on this record because of how much of that traditional sound is blended with electric guitar, care of Mihali of Twiddle. His backing vocals inject this gorgeous John Popper-esqu feel to the sound. It's such an incredible vibe and has a soaring sense of hope that is enchanting. This will give you the feels in a big way. I would put money on that. Ebeneezer's Winter: If you want an example of how incredible these guys are with stringed instruments, look no further. It's infectious chugging groove is halted only by the fact that sometimes, you have to stop bobbing your head to go, "WOW...that's so crazy good..."At about the 1:50 mark in the song is when I had to. These guys are masters. Plain and simple. This Time: The song that opens the album and more or less slaps you in the face with everything that is great about the Kitchen Dwellers. The vocals, the songwriting in general, the raw talent behind these songs and this band as a whole. This is not repetitious or boring, coming around again over and over again kinds of sounds. This is incredible. It's something so new for me to find so much love in, but I do and I have. I want to share this with everyone who has no idea they probably love this modern bluegrass sound. You can head on over to their website for additional information on the band themselves as well as check out where they are playing next. They are absolutely on my must-see list moving forward. I can't recommend this band highly enough, and I can't suggest enough that even if you think this is not your scene, trust me. It probably is.